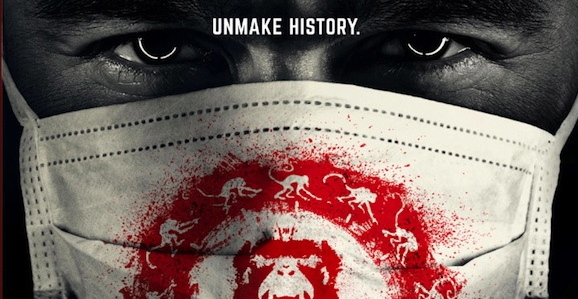 Syfy’s 12 Monkeys, their adaptation of Terry Gilliam’s 1995 time travel thriller of the same name, is set to debut in less than two weeks, and the network has been pushing their latest endeavor hard in the days leading up to the premiere. And that includes this latest offering, which is the first nine minutes of the pilot conveniently packaged for your consumption. Check it out below. Like any good introduction, this sets up the basic premise and familiarizes you with the key pieces of the puzzle. In the near future a vicious plague wipes out most of the human race, and in a desperate attempt to fix things, to hit the “reset switch,” James Cole (X-Men’s Aaron Stanford) is sent back from the year 2043 to try and reboot the future. Along the way he’ll need the help of Dr. Cassandra Railly (Amanda Schull), a well-known virologist from the present. You get a solid look at the future, which, though it isn’t the dank, claustrophobic underground environs of the film, is still totally grim as hell, and Cole and his ilk have done terrible things to survive. When you first meet Railly, a psychiatrist in the original incarnation, the look and feel are very similar to when you encounter her equivalent in the film, as she’s giving a lecture and using apocalyptic images to get her point across. Though their first meeting is not exactly smooth—Cole kidnaps Railly looking for Leland Frost, the man responsible for the outbreak—and there’s a conveniently placed information dump, but you get a good idea of the overall dark and gloomy aesthetic and mood of the show. It also indicates that whenever something changes in the timeline or a person jumps through time, you’ll be able to tell because the camera shakes and things flash. Lets hope they tone that down a bit after the pilot. This new 12 Monkeys is a much more straightforward version of the story. There’s definite room for looping, layered narratives to come into play, but it already obviously lacks the inherent strangeness that infuses Gilliam’s movie and makes it so much fun. Not to mention that in this opening you already learn that time is more fluid and able to be manipulated, rather than the fixed circle of the movie. It’s hard to judge from such a small sample size, but as I’ve been since we first heard about this project, I’m curious what the producers are going to do to set their 12 Monkeys apart from the source. From what we see here, this is very much the story as we know it, and you have to hope they’re going to branch out and do their own thing before long. Still, this snippet is compelling enough that we’ll give them a couple of episodes. We’d like nothing better than for this to become a badass new time travel series, especially now that Continuum is going off the air. What do you think of this video? Is it enough to get you to tune in? Did it make you want to sit this one out? Or are you going to hold off until you can see an entire episode for yourself? Share your thoughts with us below. 12 Monkeys airs on Syfy on Friday, January 16.